Maybe you know maybe you didn't but ShixxNOTE program is a shareware program. After you download program from pogram download site or some other shareware download site(s) you get ShixxNOTE trial 30-days valid version with full functionality. When 30-days period is expired you can register ShixxNOTE and became program customer with full tech support. On program order page http://www.shixxnote.com/html/order_now.html you can select which license you want, which license suits your needs and then click on the button "Buy Now". Then you will be transferred to my payment processor company SWREG which is part of Digital River, Inc. company and MyCommerce solution. There you can choose method of payment, currency, if you want they can save program to CD and send it to you. Anyway SWREG accept all types of payment so don't worry. After you buy ShixxNOTE 6.net 5-Users License you will receive email with download link for you registered version. Off course that link will be valid only for few days after that it expires. 5-Users License means that you can install ShixxNOTE registered version on 5 different computers (5 different IP addresses). If you have some small company with 5 computers and some extra one, than 5-Users License will be enough. SWREG payment processor company owned by Digital River corporation. After you install program on that 5 computers in your LAN, program will automatically at Windows start run network neighborhood search. Program is server and client in same time. It have one thread which is always listening on port 2000 (default port can be changed) for ShixxNOTE note data. 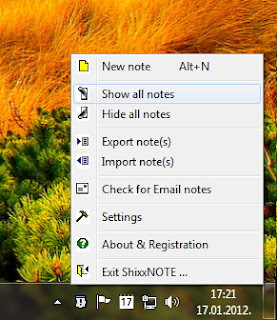 When you send note to for example 4 recipients in your LAN they will promptly create desktop note and play sound when note data is received through port 2000. That is one way how program communicate. Also you can put in a recipient list email address, IP address or name of computer in your LAN which doesn't have program installed. Then what ? ShixxNOTE will first try to send note data to that entered computer name or IP address if port is not open (maybe some firewall is blocking port 2000) than it will try to use NET SEND command to deliver just a message text and sender name. So you do not need to have ShixxNOTE installed to receive text from someone who has installed program. That NET SEND command is part of Windows Messenger service but it works only Windows 9X/Me and XP/2K if you enable it in your services. I wrote before article about how to start that service on Windows XP/2K. I didn't forget email recipient. For that program first create note picture in JPEG or BMP format, after that it create email with note picture in an attachment and all necessary note informations in email body, also email subject contains text "ShixxNOTE note from" computer. When email recipient receives note he will see it in his Inbox first but if he has ShixxNOTE installed on computer than right mouse click on ShixxNOTE tray icon and on main program menu select "Check for Email notes". After you click on that menu item program will search through your Inbox and will find all emails created by ShixxNOTE program and if email contains all necessary data in body program will parse data from email and create note on computer desktop, after that it will clean Inbox and delete that mail. Finally maybe now you are aware how program works. And I tried to describe all three was how ShixxNOTE program is sending note to recipient (directly through port, NET SEND command and via email). So I hope you will go to ShixxNOTE program homepage and buy program license which most suits your needs. Maybe in your company or ar home. But I will be glad to have one more customer. P.S. Check for special offer on ShixxNOTE program home page. Also for more info about license write directly to me. Because I also can make customized version or modified version to suit your need. It is an alternative to using the filesystem for uploaded file content.